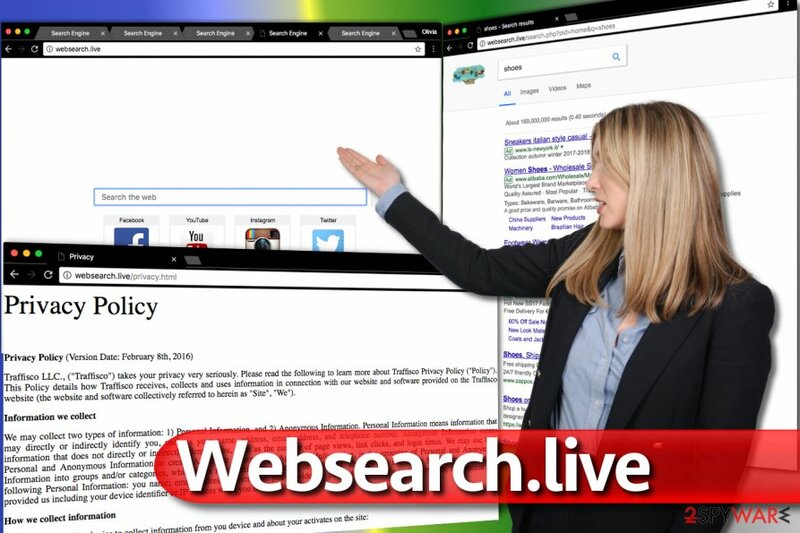 Websearch.live is the PUP that uses misleading techniques to prevent removal. Use Reimage to locate malicious components and get rid of them faster than with uninstall instructions. A full system scan blocks virus reappearance and prevents traffic to malicious domains. Websearch.live (by Traffisco LLC.) is a deceptive search site that looks entirely trustworthy at first sight. However, this questionable search engine appears in browser only after installation of a potentially unwanted program (PUP) that monitors your search queries, browsing history and uses collected data to serve third-party ads to you. The simple design of the WebSearch Live site might convince you that search it provides can be compared to Google’s or another well-known web search provider’s services. In reality, it can only be compared to other questionable browser-hijacking tools such as pwr-search.com. If you are asking yourself what the purpose of such suspicious search tool is, the answer is pay-per-click revenue. After setting itself up on a target system, it presents its services to the computer user, and if the victim starts using them, Websearch.live virus starts serving ads within results’ pages. This way, the user can unknowingly visit websites promoted by the said hijacker and earn money for the hijacker’s developers without knowing it. However, the search site doesn’t endorse the content of promoted websites, and therefore their reliability and security remain a mystery. By clicking on results presented to you by Websearch.live redirect virus, you risk entering websites that might be suggesting to install spyware, fill suspicious surveys or even display deceptive alerts from scammers. The hijacker communicates with its own servers and transmits collected data there. It can be used to deliver you “catchy” ads which you will likely find annoying. To remove Websearch.live and use your computer without interruptions, we recommend reading the tips provided by our team. You will find them right below the article. For a precise Websearch.live removal, use a trustworthy malware and spyware removal software. You can find some recommended programs below the article We suggest using Reimage as we find it extremely useful. Websearch.live virus silently installs itself on the system and starts controlling browser settings as soon as the victim unknowingly agrees to add it alongside other free program (by choosing Default/Standard installation option). To avoid installation of unwanted free programs that display ads or control browser settings (change your homepage or primary search engine), Zondervirus.nl recommends to check what additional programs software installers offer to you. You might get surprised how easily software installers can trick you into installing unexpected programs. Usually, computer users choose Default or Standard installation options thinking that these will help them to install the desired program faster and easier. That is a wrong decision to make. Always select Custom/Advanced option as it will allow you to control what programs will be installed on your computer. You should deselect every program that looks at least a bit suspicious to you. Websearch.live removal isn’t as complicated as it might appear to be (especially if you are an inexperienced computer user). Please use the directions provided below the article to clean your PC from unwanted components that are keeping the described search site in your browsers. To maximize the efficiency of the removal procedure, remove Websearch.live virus alongside other potentially unwanted programs that might be lurking in your computer system. A quick way to fetch all unwanted files and programs and eliminate them is to perform a system scan using anti-malware software. Websearch.live virus tends to modify browser shortcuts. Therefore, you must clean the links that hijacker added to them. The provided guide explains how to do it. 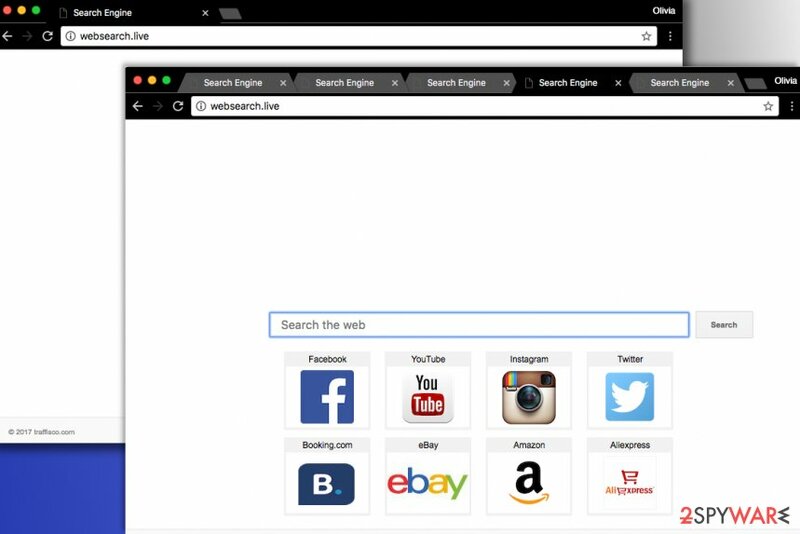 Here, look for Websearch.live or any other recently installed suspicious programs. Wait until you see Applications folder and look for Websearch.live or any other suspicious programs on it. Now right click on every of such entries and select Move to Trash. When in the new window, check Delete personal settings and select Reset again to complete Websearch.live removal. Once these steps are finished, Websearch.live should be removed from your Microsoft Edge browser. Here, select Websearch.live and other questionable plugins. Click Remove to delete these entries. Now you will see Reset Firefox to its default state message with Reset Firefox button. Click this button for several times and complete Websearch.live removal. Uninstall unknown extensions from the most popular browser to stop unwanted redirects toWebsearch.live search site. Here, select Websearch.live and other malicious plugins and select trash icon to delete these entries. Click Reset to confirm this action and complete Websearch.live removal. Here, select Extensions and look for Websearch.live or other suspicious entries. Click on the Uninstall button to get rid each of them. Here, look at the Homepage field. If it was altered by Websearch.live, remove unwanted link and enter the one that you want to use for your searches. Remember to include the "http://" before typing in the address of the page. Now you will see a detailed dialog window filled with reset options. All of those options are usually checked, but you can specify which of them you want to reset. Click the Reset button to complete Websearch.live removal process. 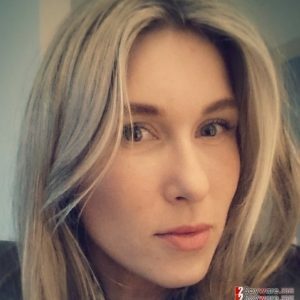 ^ Caroline Malamut. What is PPC? A Basic Guide to B2B Software Pay-Per-Click Advertising. Capterra Blog. Software Buying Tips and Advice for Businesses. ^ ZonderVirus. ZonderVirus. Malware and Spyware Removal Guides. This entry was posted on 2017-09-13 at 10:35 and is filed under Stealing programs, Viruses. You can quickly scan the QR code with your mobile device and have Websearch.live virus manual removal instructions right in your pocket. How did you remove Websearch.live virus?